Here I am, in France again visiting my parents. I made this recipe while in the US a while ago and never managed to finish it. So I figured to post it from France even if it has nothing to do with my stay, nor with what I eat here. I bought wild salmon, I don’t feel very good about buying wild fish, since we have been fishing way to much and it does hurt the environment, buying farm raised fishes makes me worry about the antibiotics and the way it’s raised…even if it said it’s sustainable…how sustainable is it? In this case, I don’t know what makes me feel better. I think veganism would be a great way to help the environment but that’s not a realistic approach to the problem. 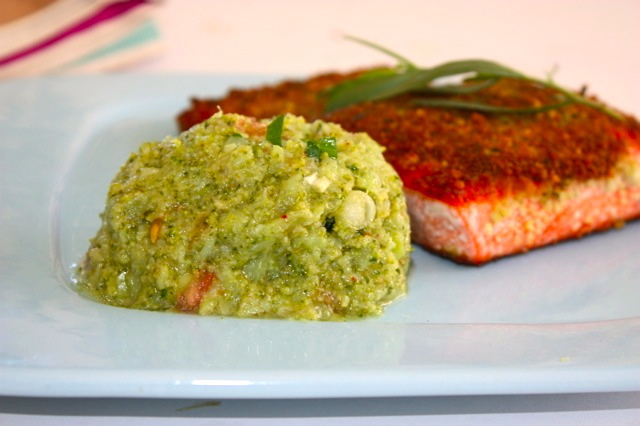 Salmon has not been on the menu for a while, so I thought why not…I love this dish, it’s very quick to make, so if you happen to have some salmon and have no inspiration on how to prepare it, this would be an nice option. It does not require many fancy ingredients, just the basics. 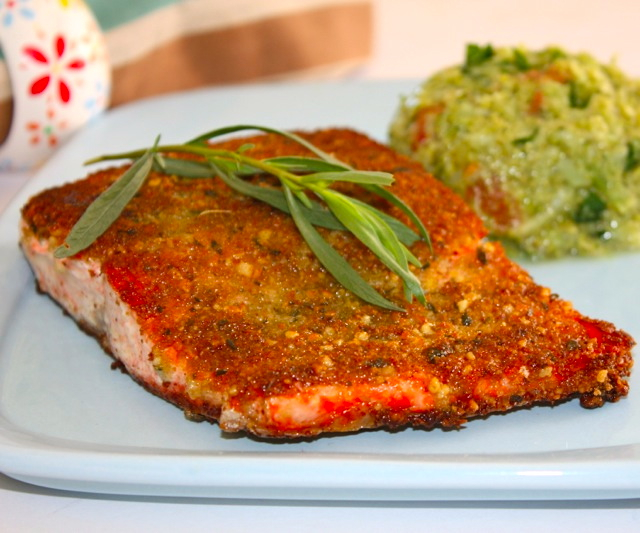 What makes this salmon fragrant are the herbs and walnuts mixed with bread crumbs, the crust gets crunchy and so flavorful. As for the salsa, I have no idea why I called it “salsa” it is definitely not a puree, it has the ingredients of a salsa but that’s about it. I couldn’t find a better name for it, so salsa it will be. No matter how you name a dish, as long as it tastes good, that’s the most important thing. In a mixing container, combine all the ingredients together except salmon fillets and egg whites. Sprinkle some salt and pepper on each sides of salmon. Dip each side of salmon in egg whites, then coat each side with the bread/herb mixture. Heat olive oil in a pan, then cook salmon until one side is cooked and golden brown. Turn on the other side and proceed the same way. Bring a pot of salted water to a boil. Cook broccoli until tender. Drain well and mash finely using a potato masher. Add all the remaining ingredients and mix well. This entry was posted by silvia on October 15, 2013 at 8:24 pm, and is filed under Express - Less than 30 minutes, Fish/Seafood. Follow any responses to this post through RSS 2.0.You can leave a response or trackback from your own site. The crust on that salmon looks to die for!